Originally plan was only to attend my youngest sister’s wedding and spend time with my parents and my family so that our daughters get to know them in real life not only through Skype callings. But God has different plan for us this time. For 8 weeks we spent in Indonesia, we learned God’s desire to see every tribe and every people to stand before His throne worshipping Him in every language they speak. We took our daughters who are 6 years old and 2 years old on this trip. This was a tough trip for them but we prayed and we asked lots of people to pray for us and the girls, asking God for what He wanted to teach and show us this time. He spoke us through the situations, people we met, and even places we visited. He opened our eyes to see the needs of His word in their lives, He showed us why they need Him, and He put the desire even more in our hearts as family to serve Him there. As Jesus gave His command to His disciples, this command is also for us, His church, in Matthew 28:18-20. This commands is also known as the Great Commandment. Maybe you think this command is only for those certain people who called themselves “missionary.” But this command is given to each of Jesus’ follower, to each of us, to you and me. We all are called to go and make disciple, to teach them the truth, to baptize them and to teach them to obey God’s commands. That means, you and I are missionaries, the messengers of God’s message to this world where we live. 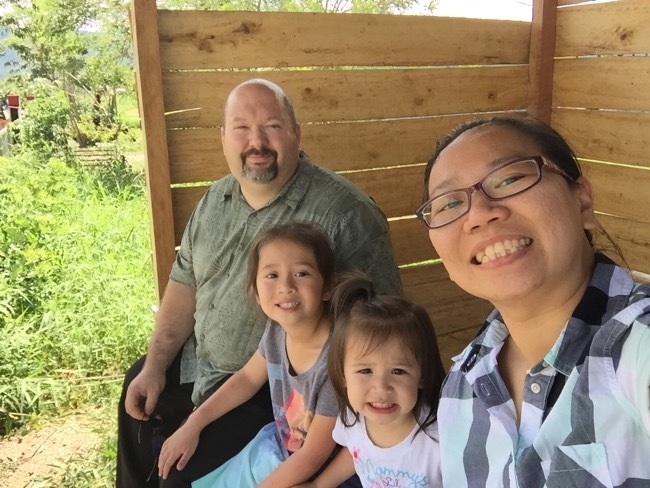 When we visited a city, we found out churches in that city are scared to step out of their comfort zone to reach out to the local people who are 100% non-believers and this people group is one of the Unengaged, Unreached People Group. The question is: Why they are scared? My heart is broken. I keep praying for this people group and for those believers who live among this unreached people group that they will have courage to go out and reach out to them, to go sharing the Good News to them. God’s love endures forever. He is patient enough waiting for each of us to repent and come to Him. 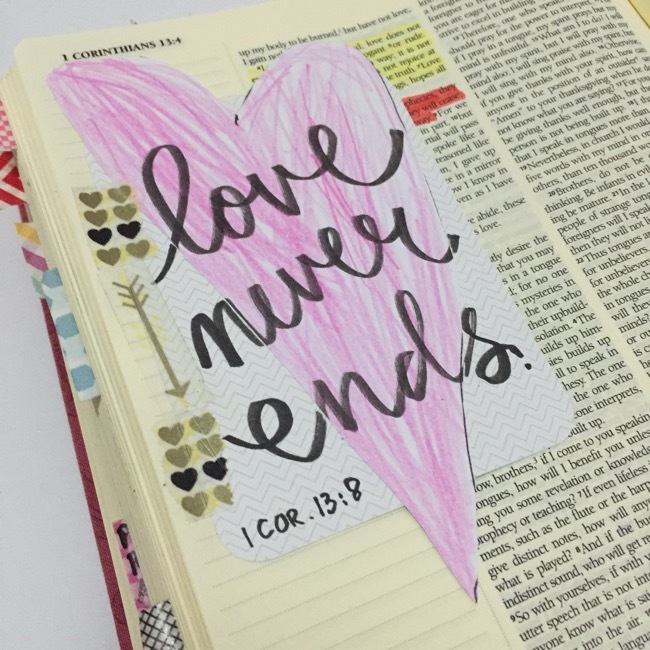 His love never ends. His love never fails. His love for the people in Indonesia is the same love he has for us who live in the States or anywhere else. There are at least 400 languages groups (people groups) who have been waiting to know God’s unfailing love to them, waiting to hear He speaks to them in the languages that they understand best in their mind and hearts. For this reason we went. For this reason we wanna go back to serve there alongside with national translators and national churches to accelerate the proces of translations of God’s word into those 400++ languages! Supplies: Field Notes pocket notebook, Pilot Gel pens. This is the truth. The center of the Bible is the Gospel. 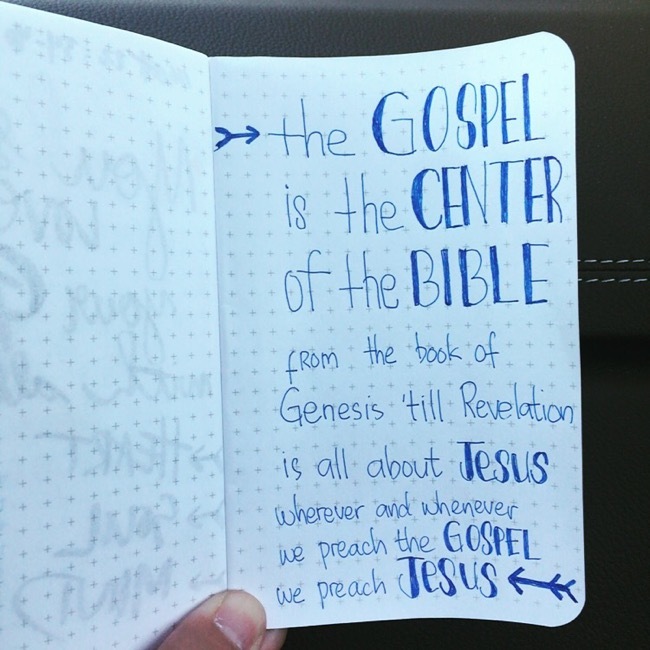 And the center of theGospel is Jesus Christ. That concludes that the center of the whole Bible is Jesus Christ. We attended a church with our friend, the preacher said something that reminds us that wherever we are sent to go, we share the Good News, we share Jesus. When we preach, we preach Jesus. Few times I was asked why we wanna take our family to go and live in Indonesia, where we could get everything and living comfortably in States. The only answer to that question is because we love Him. To love Him is to obey Him and His commandments. Our prayer is to love Him with all our hearts, souls, minds & all of our strength. Serving Him is an act of love. Because without love it is impossible for us to serve full heart. For only God who gives you and I the power and desire to serve Him (Phillippians 2:13). Supplies: Alpha Die Cut by The Cut Shoppe, Silhouette Cameo, CTMH White Daisy Cardstock, CTMH Cork button, CTMH studs, CTMH heart enamel, CTMH Mini Stapler, Prima Marketing Chalk Edgers, Elle’s Studio tag, Faber Castell PITT Artist Pens. It is only one reason. That is because God is so loved the world. He sent Jesus not to judge and condemn. He sent Jesus, His only Son to save and redeem us back to be His. He calls and sends you and I to go to our “Jerusalem, Judea, Samaria, and The End of The Earth” – to our families, neighbors, friends, and those who we do not know – is to share who He is and why He loves them that much. Would you go to where God send you? Thanks for the reminder. I have recently come to the realization that ministering and sharing God’s word isn’t for some of us as you stated. Thanks for being His hands and feet in Indonesia. Your Bible pages are so lovely. I especially like GOD in John 3:16. Thank you so much for your word of encouragement, Latonya. God bless you! Absolutely beautiful. Love all the images and loved hearing about your trip. Thank you so much for visiting my blog post today! Helen what an amazing thing your family and you did. Your so right about not only pastors or missionary are to teach others of God were called to teach to. God said for us to be a light to the world. You did a beautiful job with you pages. 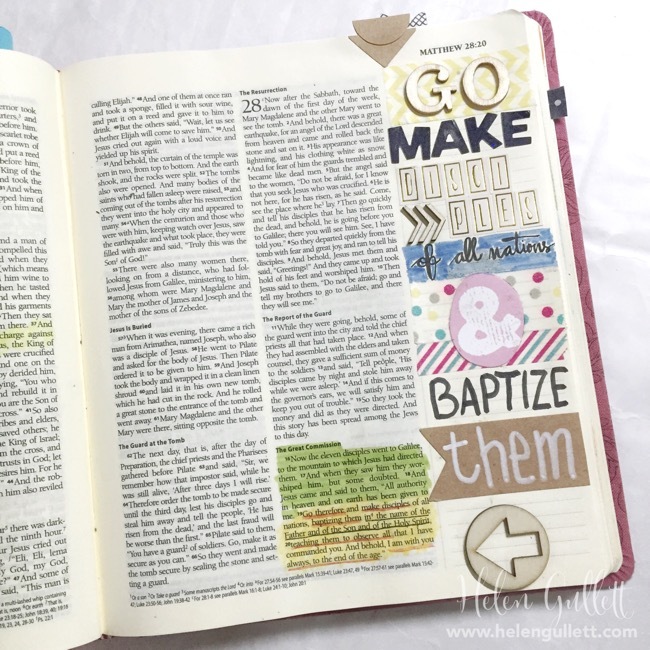 I have to find my journal bible so I can start journaling. Since I’ve moved its all packed up. Welcome Back Home! AJ, thank you for visiting! 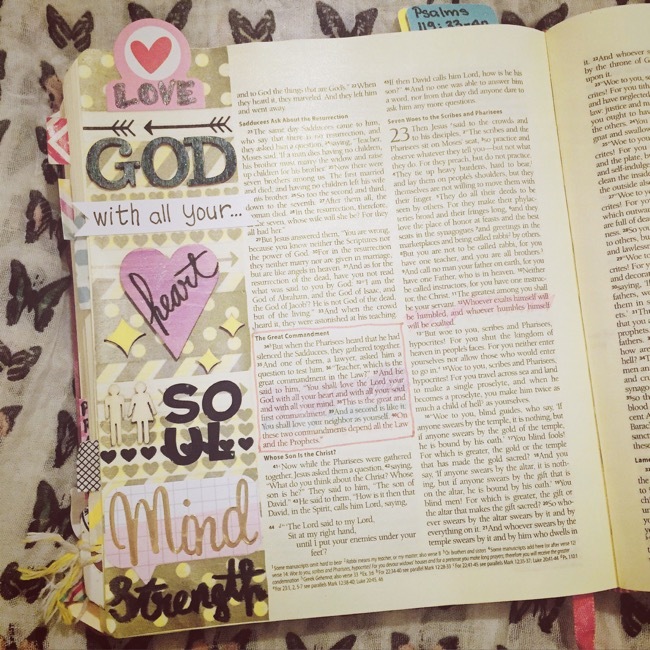 I hope you’ll find joy whn you journal His word! Blessings! 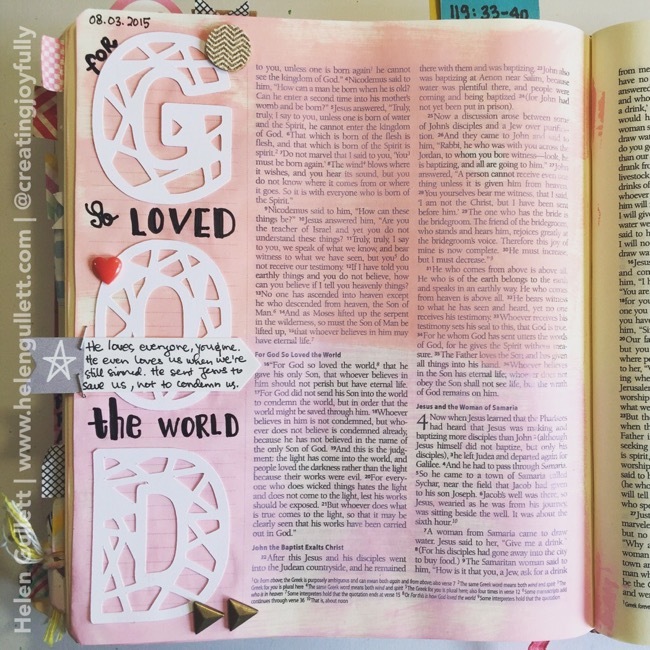 Your pages are so very pretty! I especially love the last one, that pink is so pretty! Thank you Autumn for being here!